Imagery in Satanism | What Is Satanism? 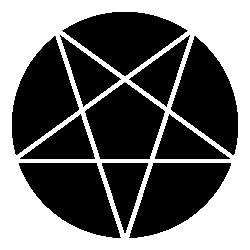 The pentagram has appeared throughout history with each point representing unique concepts within each philosophy and faith it appeared in. In 6th century BCE the Pythagoreans used symbols including the pentagram with two points facing up and one point facing down. In 16th century texts, incomplete pentagrams appeared in illustrations from occultist Heinrich Cornelius Agrippa as examples of symbols that may attract malicious spirits. Both versions (single point up and two points up with the two points up version being credited to the Pythagoreans) appear with neither being inherently "evil" nor are they associated to any devil. In the 19th century, occultist Eliphas Lévi associated the pentagram with two points upward (similar to the Pythagorean pentagram) with infernal evocations.  By the 20th century the symbol, especially the version with two points up, found itself weighted with social stigmatism. The 21st century saw the single point up version of the pentagram making an appearance into American political spotlight. The Wiccan Pentacle, or Witch's Pentacle, appeared in court battles to be recognized as a religious symbol and free from persecution as such. The goat within a pentagram was adopted from earlier occult works for Satanism. Anton Szandor LaVey is wholly responsible for the symbol becoming associated to Satanism. Church of Satan holds a trademark and copyright for the The Sigil of Baphomet. The version used by Church of Satan omits the background text and includes some additional styling. You can find officially licensed items at The iSatanist Store. Anton Szandor LaVey created another unique pentagram design that included a lightning bolt striking the lowest point. You can find more information about it here. The image that appears below is from La Clef de la Magie Noire by Stanislas de Guaita, 1897, as it appeared in the text. This work is public domain and may be encountered in many sources from web pages to jewelry and clothing. In very early texts Baphomet is only mentioned in accusations made against the Knights Templar. There are many theories about the validity of the accusations, including a theory that Baphomet was invented by the accusers, and little information about the deity the Knights Templar were allegedly worshipping. Satanism was not part of the accusations nor was Baphomet described as "satanic". 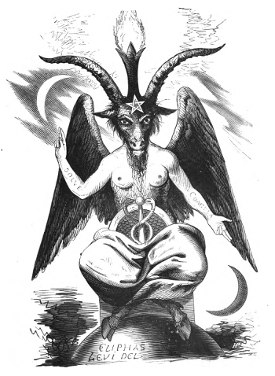 Eliphas Lévi, an early French occultist, created an image for Baphomet in his work Dogme et Rituel de la Haute Magie (English titles: Doctrine and Ritual of High Magic, Trascendental Magic). Lévi's book was inspirational to occult and esoteric movements. Lévi associated the pentagram featuring two points up with misfortune and it is worth noting that in his illustration below the pentagram appears with a single-point up adorning Baphomet's forehead. Eliphas Lévi's popular work has received a modern translation. Within its chapters you will find a rich description of Baphomet, including the image Lévi created, ripe with rich occult knowledge and imagery that inspired generations of spiritualists and magicians. Read what Anton Szandor LaVey has to say about it. Latest English translation of Eliphas Lévi's inspiring work.